When Tim Story wanted to know what he was doing in New Orleans, Dwight Ashley replied, "standing and falling". 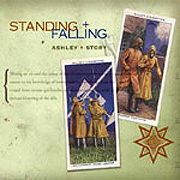 While this tale explains how their third album got its name and illustrates the differences in this duo's orientation toward recreation, the music community will need to compare their works as solo artists in order to shed light on Ashley/Story's ability to produce music beyond the reach of each as individuals. Standing + Falling (69'41") is a continuation in this duo's tradition of making Electronic Music which seeps through the porous boundaries of this genre's sub-categories. The ten tracks, each more of a realization than a composition, wander along the strange and intertwined pathways of a puzzling digital soundscape. Each track begins anew and provides music apart from convention and in defiance of expectation. Great variations in dynamic range are utilized to create a deeper spatial dimension and psychological impact. The quiet and extended reiterative passages address interiority, while elsewhere the album lurches forward with percussive grooves and warped melodies. Standing + Falling has an overtly electronic texture, yet does not feel manufactured. Through its elegant and idiosyncratic minimalism, the album provides the feel of something alive and animated.